The Eight Views of the Xiao and Xiang Rivers was a popular theme in East Asian painting and poetry. It celebrated the beauty of a region in southeast China where the two rivers converge. This album consists of eight paintings by Kano Tan’yū, a central figure of the Edo-period Kano house. When he was only fifteen years old he was named goyō eshi, or painter-in-attendance, to the Tokugawa shoguns (military commanders) in the capital city of Edo. In order to produce a wide variety of paintings for the shogun, Tan’yū had to be fluent in an array of Chinese and Japanese styles. The eight paintings in this album are in the “splashed-ink” style of the Chinese painter Yujian (active late 1200s), who was beloved in Japan. 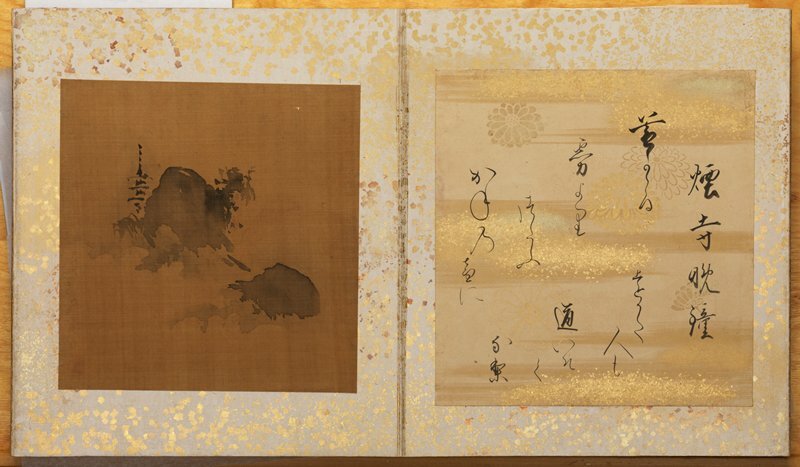 Sometime after Tan’yū completed these paintings, they were inserted into this album and paired with poems brushed on elegant paper decorated with various kinds of gold.